According to the Office for National Statistics, 506,790 deaths were registered in England and Wales in 2013. According to the Office for National Statistics, 506,790 deaths were registered in England and Wales in 2013. In a report published earlier this year, the Parliamentary and Health Service Ombudsman said end of life care could be improved for up to 335,000 people every year in England. While an estimated three out of four deaths are expected, recognising when death is imminent can be challenging even for experienced palliative care clinicians, says the National Institute for Health and Care Excellence (NICE). In July, NICE published draft guidance on end of life care for adults. This follows the phasing out of the Liverpool Care Pathway last year following a government-commissioned review that found serious failings in how it was being implemented. The new NICE guideline aims to help nurses and doctors identify when someone is approaching their final few days of life. It provides guidance on the management of common symptoms, placing the individual and their loved ones at the heart of decisions about their care. The proposed guidance is open for consultation until September 9, with a final edition expected in December. There are several physical signs that indicate a person is close to death, says the charity Dying Matters. These may include congestion in the lungs, coldness in the limbs, agitation and restlessness, unresponsiveness even when awake, discolouration in skin and changes in breathing patterns. 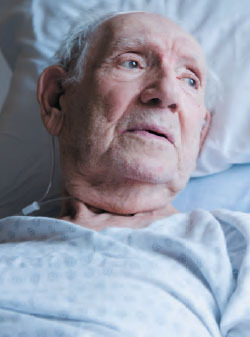 The draft guideline has several recommendations on clear communication, including promoting shared decision making, with individual care plans created with each dying person and their loved ones, plus the multidisciplinary team. NICE says that people in their last days of life should be encouraged to drink if they want and are able to do so. Patients should also be given frequent mouth care. The guidance also sets out a number of recommendations for prescribing medicines needed to manage common symptoms experienced by people nearing the end of their life. Healthcare professionals should review medication, stopping any that are not providing symptomatic benefit. ‘New guidance on end of life care is welcome. I was the RCN’s clinical lead for its end of life project, so I have been involved in creating online resources to help nurses tackle issues such as nutrition and hydration. ‘In the absence of the Liverpool Care Pathway, staffneed support to be able to demonstrate the good care that is being provided every day. We need more focus on improving communication, encouraging teams to have conversations earlier in the person’s journey.